I. Introduction: A symptom of thrips infestation on apple called pansy spot may be noticed on some varieties. This injury looks like the petals of a blossom, light in color against the color of the apple skin (Fig. 1). Thrips injury referred to as pitting was recognized in the 1950s (Swift and Madsen 1956); if the injury was no too severe, fruit outgrew the injury before harvest. A paper a few years later reported a discoloration of apple skin referred to as pansy spot (Madsen and Jack 1966). Pansy spot was determined to be caused by a reaction to the egg punctures made by thrips (the main culprit was western flower thrips (WFT), Frankliniella occidentalis). Certain varieties were more sensitive than others, notably McIntosh and Spartan (additional affected varieties in Virginia include Pink Lady and Granny Smith). These thrips move from host to host as each comes into bloom – their host range is broad. Thrips are present during bloom, when they lay eggs in flower parts. The resulting generation matures, and the resulting adults perform additional oviposition into the developing apples. The apple tissue surrounding this cohort of punctures develop the pansy spot discoloration. Other apple varieties experienced the thrips oviposition but did not develop pansy spot. II. Control Timing: Madsen and Jack (1966) determined that the best time to apply control measures was petal fall, when nymphs are present but have not produced the offending adults. Later work on WFT in apple has shown that the highest egg injury is not necessarily associated with the highest thrips numbers (Terry 1991). Often eggs are laid in sepals or other tissues where the injury does not become apparent. Eggs are often laid on more mature clusters, and on king blooms rather than lateral buds. A similar timing to that reported by Madsen and Jack (1966), but possibly a little earlier, was determined more recently in British Columbia (Cockfield et al. 2007), who found the greatest impact by a spray resulted from application from full bloom to about 5 mm fruit diameter. Few eggs were laid in ovary tissue during bloom – eggs in this tissue (most likely to cause pansy spotting) increased starting about 8-13 days following full bloom. Obviously bloom sprays can’t be used in order to protect pollinators; therefore, the optimal spray timing would be from petal fall until 5 mm fruit diameter. III. Sampling: Thrips can often be detected by examining the interior of floors, or wrapping blooms on a sheet of paper to dislodge the tiny insects. However, additional sampling methods have been developed. Different color sticky panel traps were compared in British Columbia (Bradley and Mayer 1994). Blue and white traps caught 4- and 3- times more thrips than yellow traps. Several chemical attractants were added, but these did not provide enough added attraction to be worthwhile. Beating trays still compared favorably for versatility and speed of data collection. In Australia, sticky traps were found to be better than beating samples, and blue traps were also considered the best (Broughton and Harrison 2012). Chemical attractants helped with some thrips species (including WFT) but not others. IV. Environmental effects and biological control: There is variable natural mortality of thrips. There is a non-feeding pupal stage that occurs beneath the soil surface. If there is significant rainfall at this time, many of these pupae drown, resulting in lower adult populations. Various types of ground cover were compared in British Columbia apple orchards: Bare soil, grass and weedy ground covers were compared for their impact on WFT populations. Weedy ground cover increased WFT in trees during the first week of bloom, but this did not cause an increase in fruit injury. The F1 generation of WFT (the generation causing pansy spot) in cluster samples were lower in trees where green lacewing larvae were introduced at bloom. Still, these population differences were not associated with differences in fruit injury (Cossentine et al. 1999). Nicholls et al. (2000) also found thrips populations were reduced by flowering ground covers, apparently by fostering natural enemies. Anthocorids such as Orius are effective predators of thrips. V. Chemical management of thrips: Thrips are prone to develop resistance to insecticides; it is therefore important to rotate among mode of action classes. However, options are limited. In our control recommendations (VCE 2018), the following materials are listed for thrips on stone fruits (we have not included thrips in the apple section until now; the peach materials are also available in apple): Assail (G), Delegate (E), Entrust (E), Lannate (G). Another material, with an additional mode of action is Surround (kaolin). This may be an effective tool against WFT; Larentzaki et al. (2008), reported that kaolin increased mortality, decreased oviposition, and decreased hatch of eggs in onion thrips, Thrips tabaci. At orchard meetings, we discussed the potential impact of the plant growth regulator Apogee (prohexadione-calcium). While there is little information on the efficacy of this use, there has been some promising research on effect of Apogee on other insects. Paulson et al. (2005) examined the role against pear psylla (PP), spirea aphid (SA) and obliquebanded leafroller (OBLR). PP populations were reduced in appear, as well as SA and OBLR in apple. Not only was there direct mortality, but there was a synergistic effect against PP and SA when imidacloprid was added. Tsagkarakis et al. (2012) reported that Apogee reduced egg production and survival of Asiatic citrus psyllid. There should be control to further investigate the role of Apogee since not all studies have been consistent – for example, no effect was reported for potato psyllid (Prager et al. 2013). Bradley, S. J., and D. F. Mayer. 1994. Evaluation of monitoring methods for western flower thrips, Frankliniella occidentalis (Thysanoptera: Thripidae), during the blossom period of 'Granny Smith' apples. J. Entomol. Soc. Brit. Colum. 91. Broughton, S., and J. Harrison. 2012. Evaluation of monitoring methods for thrips and the effect of trap colour and semiochemicals on sticky trap capture of thrips (Thysanoptera) and beneficial insects (Syrphidae, Hemerobiidae) in deciduous fruit trees in Western Australia. Crop Protect. 42: 156-163. Cockfield, D., E. H. Beers, D. R. Horton, and E. Miliczky. 2007.Timing of oviposition by western ﬂower thrips (Thysanoptera: Thripidae) in apple fruit. J. Entomol. Soc. Brit. Colum. 104: 45-53. Cossentine, J. E., E. J. Hogue, and L. B. M. Jensen. 1999.The influence of orchard ground cover and introduced green lacewings on spring populations of western flower thrips in apple orchards. J. Entomol. Soc. Brit. Colum. 96. Larentzaki, E., A. M. Shelton, and J. Plate. 2008. Effect of kaolin particle film on Thrips tabaci (Thysanoptera: Thripidae), oviposition, feeding and development on onions: A lab and field case study. Crop Protect. 27: 727-734. Madsen, H. F., and I. D. Jack. 1966 The relation of thrips to pansy spot on apples. Can. Entomol. 98: 903-908. Nicholls, C. I., M. P. Parrella, and M. A. Altieri. 2000. Reducing the abundance of leafhoppers and thrips in a northern California organic vineyard through maintenance of full season floral diversity with summer cover crops. Agric. Forest Entomol. 2: 107 - 113. Paulson, G. S., L. A. Hull, and D. J. Biddinger. 2005. Effect of a plant growth regulator prohexadione-calcium on insect pests of apple and pear. J. Econ. Entomol. 98: 423-431. Prager, S. M., O. M. Lewis, K. Vaughn, and N. Nansen. 2013.Oviposition and feeding by Bactericera cockerelli (Homoptera: Psyllidae) in response to a solar protectant applied to potato plants. Crop Protect. 45: 57-62. Swift, J. E., and H. F. Madsen. 1956. 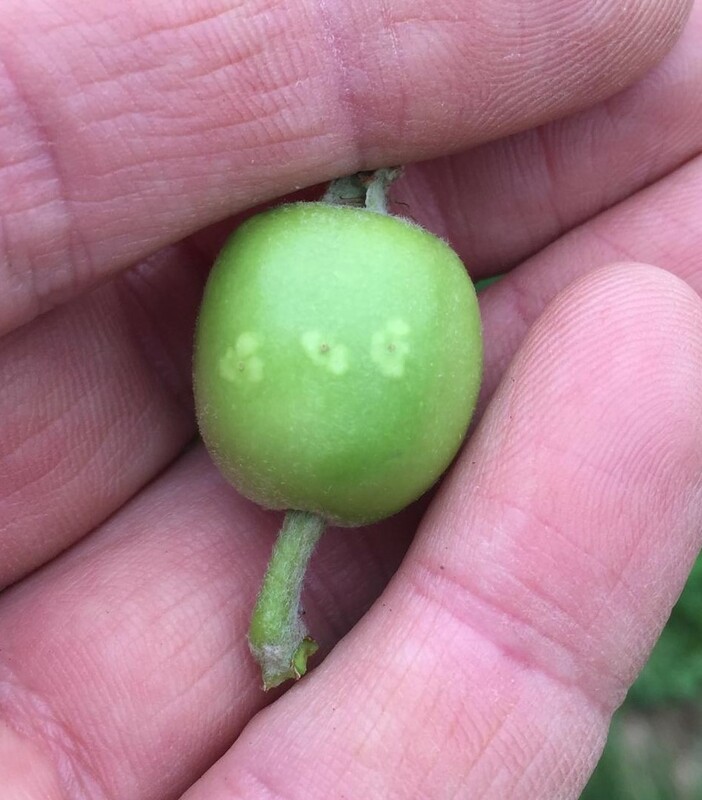 Thrips damage to apple. J. Econ. Entomol. 49: 398-399. Terry, L. I. 1991. Frankliniella occidentalis (Thysanoptera: Thripidae) oviposition in apple buds: Role of bloom state, blossom phenology, and population density. Environ. Entomol. 20: 1568-1576. Tsagkarakis, A. E., M. E. Rogers, and T. M. Spann. 2012. Applications of plant growth regulators to container-grown citrus trees affect the biology and behavior of the Asian citrus psyllid. J. Am. Soc. Hortic. Sci. 137: 3-10. VCE. 2018. 2018 Spray Bulletin for Commercial Tree Fruit Growers. Va. Coop. Ext. Serv. Publ. 456-419.